The brand-new certification gives options to consumers looking for cleaner cannabis. Steinkraus spends the next several hours explaining to inspector Jen Silverman how he grows his plants – with love and painstaking care, but without pesticides. That’s because this hot August day is the first-ever inspection for Colorado’s new pesticide-free cannabis certification, administered by the Organic Cannabis Association (OCA). Denver Bud Company is the first grower to ever pursue it. Silverman, notebook in hand, listens intently as Steinkraus describes his pest care regimen for the mother plants. To control pests, he says, he mixes reverse osmosis water with rosemary oil and eucalyptus oil. “Every four, five days, I’ll give the plants that nice organic spray of essential oils,” he says. 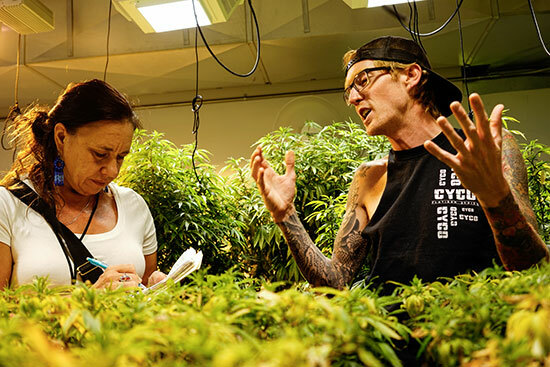 Inspector Jennifer Silverman, left, takes notes while Denver Bud Company grow operations director Eric Steinkraus, right, explains his growing practices, during the first-ever inspection for the new pesticide-free cannabis certification. Silverman counsels Steinkraus to add the rosemary-eucalyptus spray to the pest plan he’ll submit as part of certification. They discuss his other pest prevention measures: an organic soil mixture, proper airflow and ventilation in the room, a neem-oil based miticide used on occasion. Everything Steinkraus uses is “OMRI Listed” – certified by the Organic Materials Review Institute, the organization that actually decides whether a product is organic under the USDA National Organic Program. Silverman, who’s been doing USDA organic certification on farms of all sorts for more than 12 years, shares best practices with Steinkraus as they walk the floor. To be clear, this is not an organic inspection. Cannabis is still a federally illegal substance and thus can’t be called “organic,” nor can it be certified organic by the USDA or otherwise – but everyone in the room believes it’s only a matter of time before that changes. Pesticide-free, in a sense, is the launch pad. 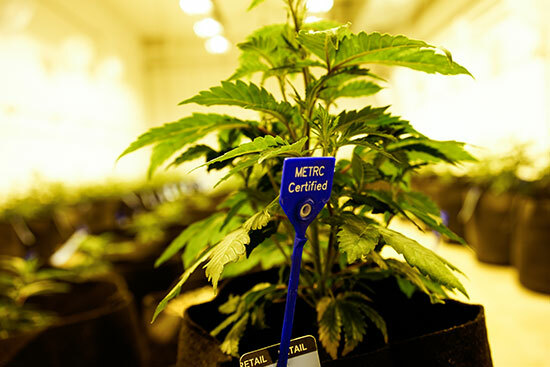 Every single legal cannabis plant in Colorado must be labeled with a tag and unique number assigned by Colorado’s Marijuana Enforcement Tracking Reporting Compliance group, or METRC, like this one at Denver Bud Company. 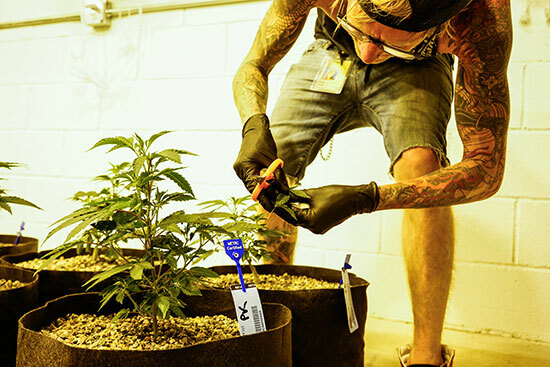 In the vegetative room – or “veg” room, where baby clones become teen plants – they begin sampling. Steinkraus dons sterile gloves, dips his clippers in alcohol, clips a few leaves from a plant toward the front of the room. 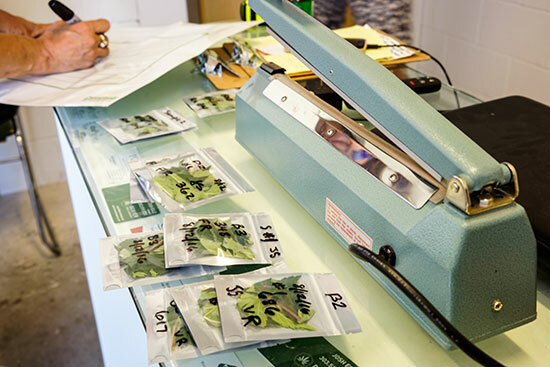 He slips the leaves into a sample baggie, which Silverman labels with the room number and plant number – the same number assigned by Marijuana Enforcement Tracking Reporting Compliance, or METRC, to trace every cannabis plant on the Colorado market from seed to shelf. Steinkraus and OCA cofounder Ben Gelt look on as Silverman weighs the baggie. Steinkraus clips a sample of cannabis leaves, to be bagged and sent off for pesticide sampling. Steinkraus bags a sample of cannabis leaves, preparing them to send off for pesticide testing. They repeat the process, clipping samples from plants at the middle and back of the room. Silverman seals the baggies inside a larger bag labeled with the room number. They follow the same procedure for both veg rooms. Later, they heat seal the larger bags to prevent tampering. It’s up to Denver Bud Company to safely store these samples and transport them to the lab to be tested for pesticide residues. In a few days, Denver Bud Company will receive an OCA inspection report. “Based on what we heard today, it sounds like there may be some small adjustments Jen will recommend,” Gelt says. A second site inspection will follow, and Silverman will sample from the flowering room. Down the road, she’ll pay a surprise visit, too. If all goes well, Denver Bud Company will have pesticide-free certification within a few months. This process is designed to be even more rigorous than USDA organic certification, Gelt says, requiring up to four inspections and as many rounds of samples. The price tag starts at $5,000, and certification and the distinctive pesticide-free label both last one year. Hundreds of growers have inquired about the process, and more than a dozen are already in line for their first inspection. 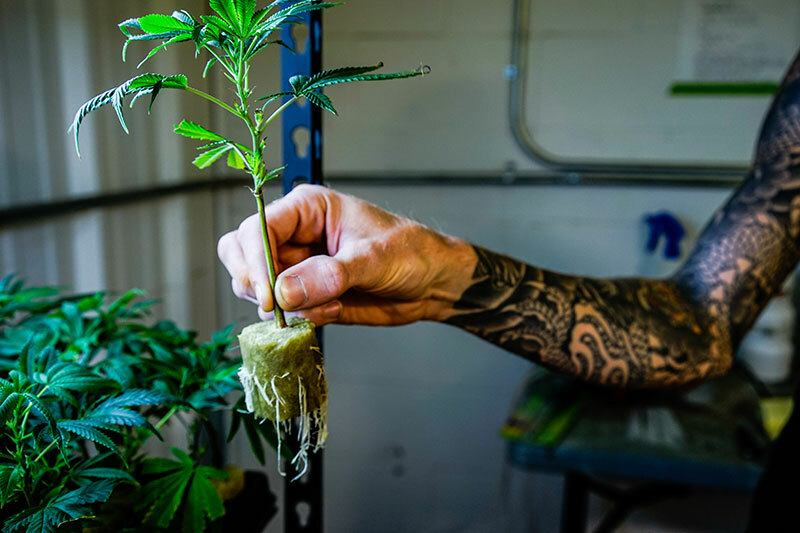 OCA hopes to complete at least five certifications in Colorado by year’s end, and enter other states where recreational cannabis is legal by early 2017. With the ability to charge a premium for their certified product – it’s unclear exactly how much more, but organic foods sell for an average of 47 percent more than conventional food, according to a recent study – growers like Josh Egle, founder of Denver Bud Company, say the process will pay for itself. Silverman labels a large bag, into which smaller sample baggies filled with cannabis leaves from Denver Bud Company will be inserted, sealed and sent off for pesticide residue testing. For OCA founder John-Paul Maxfield, who also owns Waste Farmers and Maxfield’s, an organic soil company, creating a pesticide-free certification is all part of the pursuit to make the world a more sustainable place through better agricultural practices. Pesticide-free certification is crucial in helping the cannabis industry catch up with food, he says, and allows consumers to choose their cannabis with the same values they apply to food.